There are many wild and exaggerated stories about snoring. It is one of those things that are treated very much as a source for comedy. However if you snore regularly or are the partner of someone who does, you will know that it is far from amusing. Snoring can be very disruptive not only to your sleep but to your daily life. There are the potential for serious health problems, lack of alertness, mental health issues and a poor quality of life. These issues can affect both the snorer and their partner equally. How do you know? As Mark Twain's Tom Sawyer said 'There ain't no way to find out why a snorer can't hear himself snore'. The truth of the matter is that nearly everyone snores at some time or other. Most people only find out that they snore if someone is '˜kind' enough to tell them. While some people snore regularly most people for a variety of reasons snore occasionally. Looking at people who snore regularly, about 40% of men do snore regularly but 24% of women are also frequent snorers. When a woman becomes pregnant she is more likely to snore, although after the pregnancy the snoring will tend to drop back to the 24% level. Interestingly between 10 to 12% of children snore. While this is true, it is not so much the alcohol that make you snore, it is the way that it relaxes your muscles. When you become more relaxed the likelihood of your tongue relaxing in your throat increases causing a partial blockage. It is the air forcing its way past the blockage as you breathe that causes the sound. A similar increase in snoring will happen with anything that you take that cause a relaxation of muscles. Many drugs, prescription and others, can cause muscles to relax. Many antihistamines can result in snoring. This is not really accurate. Having excess fat can cause a person to snore, it depends where on the body the fat is. What tends to make people snore is an excess of fat around the neck, especially internal fat which may not necessarily be visible externally. This helps exacerbate the restriction in the airways leading to the snoring sound. Occasional snoring can be inconvenient, such as when you have a cold, but regular snoring had health implications, some of them which can be serious. The obvious result of snoring is disrupted sleep, both for you and whoever shares your bed. 50% of people suffering from Obstructive Sleep Apnea (OSA) have high blood pressure, while only 25% of people with high blood pressure have OSA. Regular snorers are 5 times more likely to develop hypertension, have heart disease, have a stroke, develop type 2 diabetes and have high cholesterol than someone who only snores occasionally. A survey carried out by the Australian Sleep Health Foundation found that the partners of snores reported in 56% of cases there was a negative impact on their health and wellbeing. While over 40% said that their partners snoring affected their alertness and general mood. 23% suggested that the sound of mating possums (this was an Australian survey) was more bearable that their partners snoring. After snoring treatment it was found that the physical and mental health of partners of snorers improved significantly. 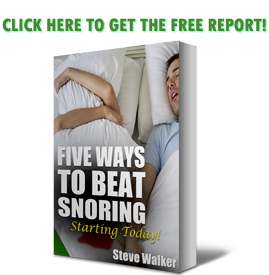 It has been that reported 70% of snorers have a familial link. This is one of those figures that can be misleading when not looked a more closely. The simplistic view that is if a parent snored that you are likely to snore in 7 out of 10 cases and there is nothing that can be done about it. What is not said is the reasons behind the snoring. If it is due to lifestyle that your parent snored and you have a similar lifestyle then, yes there is a good chance that you may snore. However, if your lifestyle differs from the snoring parent i.e. not smoking, not overweight, only drink alcohol moderately there is no reason why you should snore. Many people believe that the only way to treat snoring is by either having surgery of wearing a face mask that pumps air in to you as you sleep. This is a common myth. In the vast majority of cases stopping snoring can be solved by yourself. Unless there are medical reasons why you should have surgery or need a positive pressure mask for sleeping there are a number of home remedy devices that, although they will not '˜cure' your snoring they will in most cases stop you snoring. These work in one of two ways. Firstly there are Mandibular Adjustment Devices (MAD) that you wear while you sleep. A MAD slightly eases the position of the lower jaw slightly forward. This has the effect of lessening the chances of the tongue falling back and blocking the airway. The second type attach to the tongue by suction and then there contoured flange which fits outside the mouth and holds the tongue forward helping to keep the airway open in a similar way to a MAD. Both of these are quite sophisticated designs which should not be confused with cheap bits of plastic which do not work. In 1997, during a divorce case in Iran, the wife admitted drugging her husband after they were first married so he would not know that she snored. As people age the likelihood of them snoring increases but once men reach age 70, the percentage of men who snore decreases. It does not say if this is due to snorers being less healthy and not living as long as non-snorers.